Baking a cake is a pleasurable experience. A well risen springy cake makes my day. Few days back, my daughter whined that I had not baked a cake since long and that she longed to eat one. She requested me to bake one and I readily obliged. It was post afternoon and I was free. The weather was very pleasant. It was cloudy and cold breeze indicated that it was raining in the hills. For me good weather and good mood has a very strong connection with good cooking. Recipes turn out perfect when both the factors are conducive. 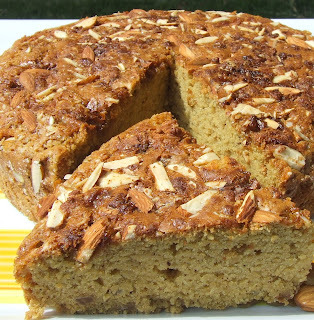 I decided to make almond Jaggery cake. Best thing about this cake is that the ingredients are simple and always available at home. This cake has a rustic charm to it. 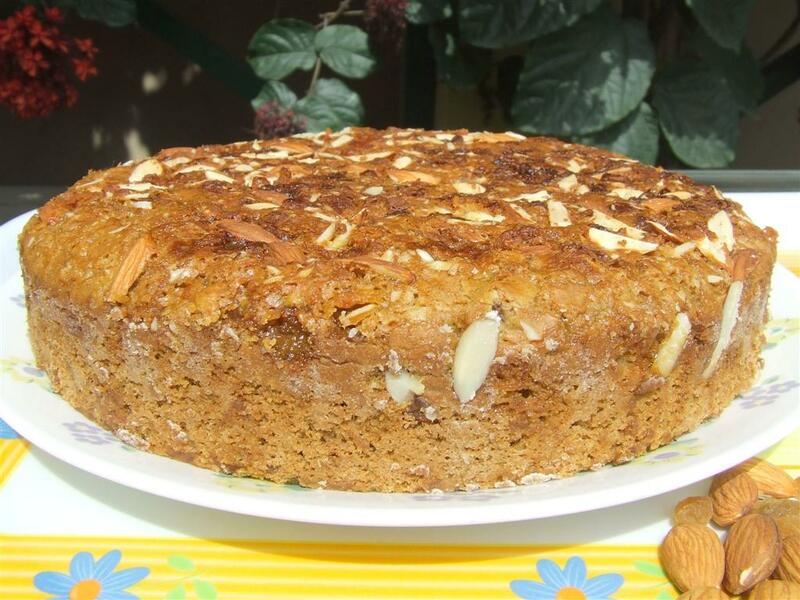 When freshly baked, the jaggery topping makes it chewy. Later, the jaggery makes the top really soft and melt in the mouth. I used whole wheat flour in the cake instead of refined flour. Grease a round 8 inch cake tin and line with a greased brown paper. Sieve flour, cinnamon powder and salt in a bowl. Add softened butter and mix well. In a separate bowl, mix together milk, water, sugar, and vinegar. Add soda bi-carb. Add this milk mixture to the bowl containing flour, cinnamon powder and salt. Mix well so that the mixture becomes smooth. Now add to this batter chopped almonds and raisins coated with flour. Reserve some almond for sprinkling on top. Mix gently. Pour in the greased tin. Sprinkle the remaining chopped almonds and crumbled jaggery evenly on top. Bake at 180 degrees for about 40 minutes. Insert a skewer. If it comes out clean, the cake is done. hi. i loved your recipe.i am new at baking, i tried this recipe yesterday with few alternatives. thats why maybe it didnt come out well. i didnt have plain butter so i used vegetable oil instead. and i didnt have raisins and cinnamon powder, so didnt put it. and i reduced sugar quantity to 3/4 of cup. cake risen well and it looked great, but when tasted it felt uncooked and sugar less. I know i didnt use recipe completely but what is major mistake in it. and can anything be done with cake now? Hello! Welcome to my blog. I am so happy that you tried this recipe. I feel that the cake needed some more time in the oven. Even if the top is browning, the center may not be cooked. Whole wheat cakes take longer to bake. Did you insert a toothpick in the center? 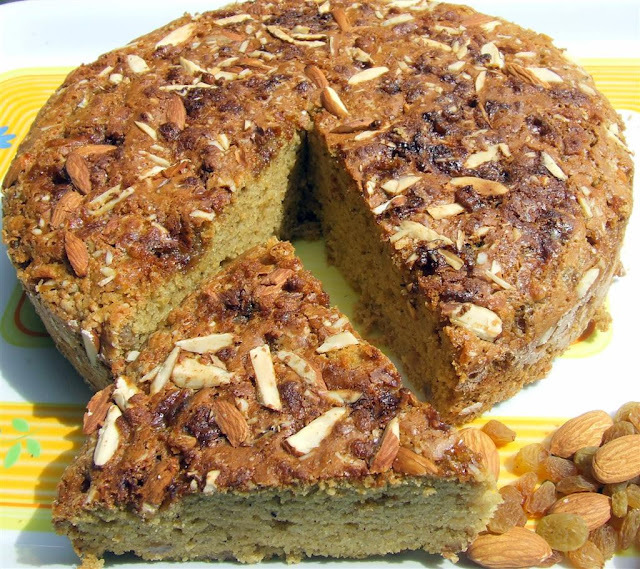 Now you may slice the cake and bake in a preheated oven at 180 degrees C for 10 minutes. You'll get crisp rusk like slices. Thanks.I will try it one more time.